The same applies to our financial and economic system which is broken due to separation of borders, different pay scales and fiat currencies based on nothing, not even gold. For this reason Blue House Free Schools has moved with the times and has begun accepting cryptocurrencies for payment and for supporters to make contributions so that Blue House Free Schools can keep operating in the Private Realm travelling about and gifting free knowledge on wellness and lifestyles of self sufficency. Of course if you still prefer to use old fashioned money, you can gift and contribute here on gofundme. As for the Blue House Free School Bus and the Free Blue Library moving. Nimbin is like a big magnet. I tried to leave 4 weeks ago but the water pump in Atlantis has siezed up. Atlantis is in need of repairs so we cant go anywhere until she is fixed. The water pump has siezed up ($200), she needs 4 new tyres ($1220), a couple of uni-joints on a drive shaft ($400), electrical work, ($350). If you can help out with a few dollars it would be appreciated so that I can get her back on the road and many more people, including you, can enjoy the dream and can visit to discover my secrets to wellness and happiness. Cecil Street Nimbin outside of Djanbung gardens. I arrived in Nimbin for the Mardi Grass with $2.70 after Atlantis had a blow out on the way here. Mardi Grass celebrated its 25th anniversary and after the party was over I decided to stay for the permaculture open day at Djanbung gardens. Then on Sunday night when I went to leave and started Atlantis there was a nasty sound. Alas! 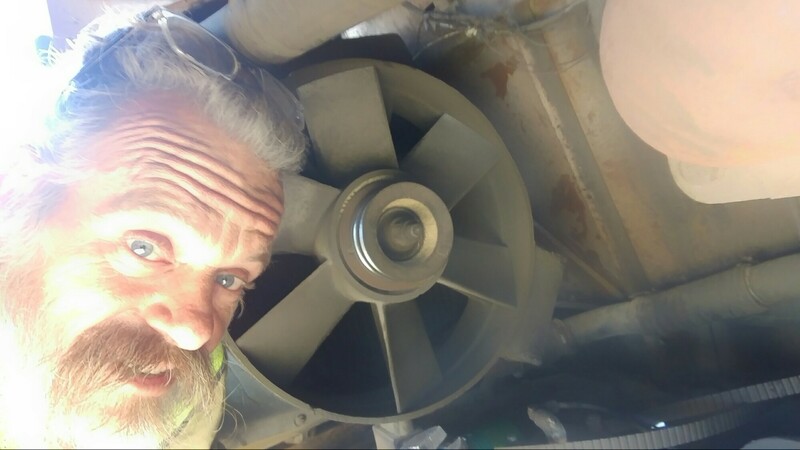 The water pump needs fixing. So here I am. I’ve been making the most if the opportunity to study natural complementary medicine, botanical healing and many more things that are available from the wealth of knowledge of the people of Nimbin. I’ve had amazing conversations with murderers, witches, healers, victims of state violence like junkie ex-undercover cops and people force medicated with children abducted by the state. Today it was the Blue Knob Fibre Festival where I saw some amazing basket weaving work and listened to artisans speak on their different textile crafts. and tomorrow its the Repair cafe day and a bicycle maintenance workshop at Djanbung gardens. The weekend evenings here in Nimbin always have something to do and Friday night hosts the drumming circle and dancing in the street. Plus during winter there is a fire in the park and people sitting about having a yarn. While it’s raining knowledge and experience it’s very dry here with regards to making any progress to get out of Nimbin. I’d love to be on my way to a new destination but I haven’t enough money to repair Atlantis . So here I am. Can you contribute some money so that I can fix Atlantis and get in my way? contribute to Blue House Free Schools here. The Quantum Release festival is over where we held space and inspired many. I would call our mission successful. 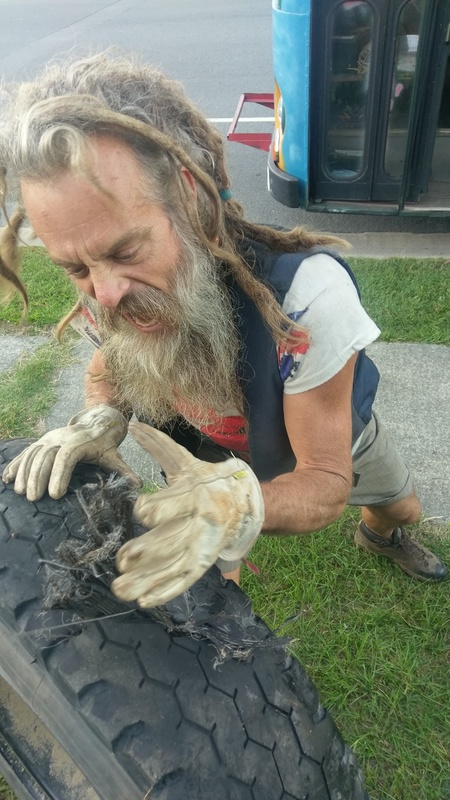 However returning to Bundjalung, Atlantis has broken down again this time with a flat tire, and a leaking water pump as well as a fractured tensioner. I don’t have a problem with this because I feel that everywhere I go I am in the right place that I’m supposed to be so here I am in Indy Court Nerang. I was returning from the quantum release festival where I’ve been holding workshops on Wellness and sustainability when Atlantis started to vibrate so I stopped to check the tires but it appeared as if nothing was wrong. Within a minute of continuing the tire blew out however luckily I was only 400 metres from a service station so we had a nice place to stop and change Atlantis is tire under lights. The Blue House free school held many successful workshops including Quantum Pause meditation,Tibetan yoga, natural hygiene, waste minimisation, amongst many others during the festival. The next step is to get all of these things fixed on Atlantis so that we can go on our journey to our next magical place of learning and sharing our knowledge of healing and wellness. 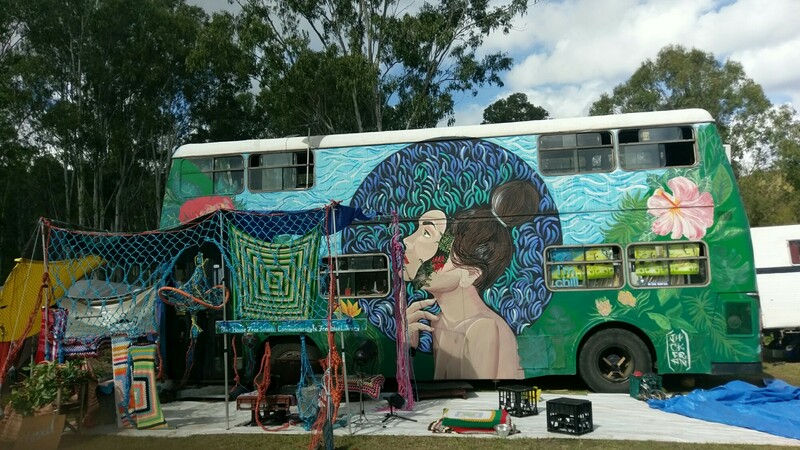 Back to Atlantis, I picked her up on the 30th of January 2016 and then spent eight weeks with a group of artists decorating her in Rundle Street Kent Town. I also had a go at painting the outside of Atlantis but I have spent most of my time working on the inside. Inside Atlantis is the “Free Blue Library” and “James’ Blue House Free School”. The majority of the fit out used post consumer items that were excess to their original owners needs. We live in such a wasteful society that promotes consumption that it is relatively simple to find “stuff” that people no longer have any use for. This consumer society also seems to produce its fair share of hoarders suffering obsesive compulsive disorder (ODC). Having been close to a number of people with OCD it is rewarding that I can help them dispose of their accumulated stuff and they can know that their contribution is going to a good cause. I think people in particular hoard/collect books because of the emotional content that many books contain. My job is to collect these unused books sitting in boxes in the garage and to be the conduit to get them back into circulation and use. Over the past 8 weeks I had collected 31 milk crates of books and in only one day at the Blenheim Music and Camping Festival, I managed to dispose of 6 crates of books by giving them away. I also ask people for contributions of more books and gold coins so that I can continue travelling, teaching and giving out free books. My maiden voyage was from Kent Town to the Blenheim Festival in the Clare Valley. I left Kent Town about 4pm for the 122km drive. There was a long line of traffic behind me as I left Adelaide and I sure got some interesting looks. First stop was the service station to put air in the tyres. I had pumped up the tyres a lot before I left but the first little “heavy duty” compressor that I got from repco melted, gave up and died in the process so I had to get a bit of help from a bigger compressor. The stop at the servo took a while. The tyres of Atlantis have to be at 100psi and most cars are only 32psi. Fourty Five minutes later the tyres were inflated and we were on the road again. As I got on the country roads I had to be hyper aware of the height of Atlantis, 4.2m, and the low overhanging branches. Sometimes I need to cross a little onto the opposite side of the road to avoid low hanging branches. This is one restriction and I envisage that the future mobile schools will be in normal buses or big 4WD trucks. I arrived about 9:30 at the site of the Blenheim Festival and set about helping set up the festival and then the next morning I put all the books outside in preparation for the festival. Over the day I held a number of workshops on Quantum Pause Breathing Meditation, an introduction to the 5 Tibetan Rites of rejuventaion, sustainability, local and community exchange systems and also “Bed Time Story Telling” for the grown ups that wanted to chill before heading back to their tents to sleep off their cocktail of intoxicants. It makes me happy to see the looks of wonderment and awe by all who visit and know that I have insprired them somehow. I look at Atlantis myself and am filled with gratitude for what we have collectively co-created. Someone who visited said you must be proud of your achievement but to have pride wouuld leave me open to scorn. This is a collective effort of many people who have sacrificed much time and effort. My parents and my children who haven’t seen me for nearly 4 months, the artist, the monetary contributors, and all who share my journey on social media. If there is anything that I feel, it is great humility for the honour of being an inspiration to so many people. The next stage of my journey is the trip back to see my family in Brisbane. I am looking for travelling companions/guest interns/facilitators to join us on the road. There is an application process and all. Here is the link to the Gumtree Ad. Now, I am waiting on oil and oil and air filters so that “Atlantis” is fit for the journey. In the meantime I am contacting local councils so that I can use their parks to offer my free services: The Free Blue Library, and James’ Blue House Free Schools classes of health, sustainability and digital literacy. I have achieved many of my goals so far but there is still a long way to go. Next I want to put a solar energy system on Atlantis and increase my IT capacity and digital learning tools so that I can offer top quality classes of digital literacy. You can help too by contributing to my Gofundme campaign here. Maiden Voyage of Atlantis by James Arthur Warren is licensed under a Creative Commons Attribution-ShareAlike 4.0 International License.